Police in Ogun State have arrested a 37 year old man, Ifeanyi Ajaero for chaining his wife to a generator from night till morning. Ajaero chained his wife, 28-year-old Obiageli to the generator on the night of Friday, April 14, till the next morning, Saturday, 15th April, 2017 after beating her to stupor. 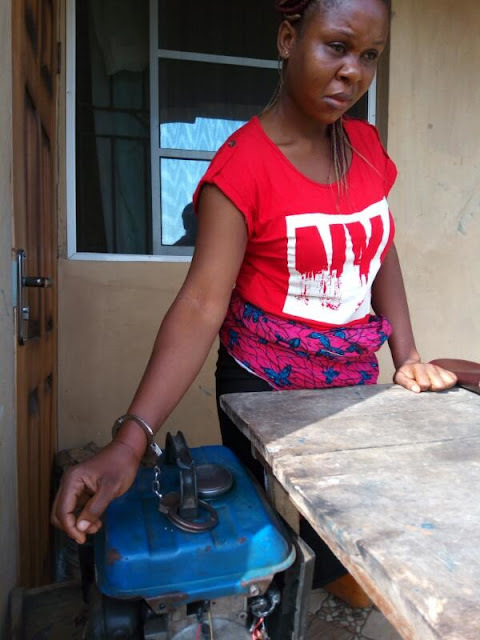 The Ogun police interrogated the suspect and he admitted to chaining his wife to the generator, but claimed his actions were for “self-defense”. The State Commissioner of Police, Ahmed Iliyasu, who spoke on the issue, described the action of the suspect as the height of wickedness. He ordered the immediate transfer of the case to Anti- Human Trafficking and Child Labour Unit of the state Investigation and Intelligence Department for further investigation and prosecution.